4PM WEDNESDAY 24 JULY: Confirmation that local Conservative councillors and the campaign strategy team had signed-off my suggestion for a postal vote recruitment campaign. Hat-tip and thank you to Jason Allen at DA Printers Ltd in Rochester, who always deliver on time and within budget. 9AM MONDAY 29 JULY: Commence mail merging 20,000 letters and PV forms using three high speed laser printers which can, between them, churn out 7,500 copies per hour! Merging completed by 5pm. 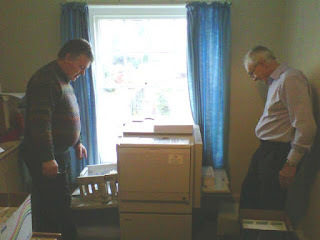 9.30AM TUESDAY 30 JULY: Volunteers John Balcombe and Allan Sullivan come in to overprint freepost address on 20,000 reply-paid envelopes. 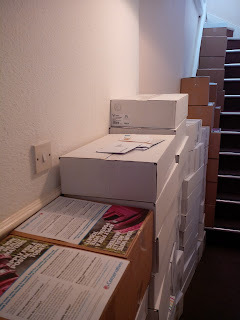 Letters and postal vote forms folded and collated for individual households in street delivery sequence. Supplies delivered to packing venue. 9AM WEDNESDAY 31 JULY: 30+ volunteers gather at packing venue and between them pack 20,000 envelopes. Boxes delivered to branches for door-to-door delivery. 8PM: news that some keen activists have already completed their deliveries! So, to recap: in just 7 days, 20,000 letters and postal vote forms designed, printed, mail merged, folded, printed and packed and the first letters dropping onto doormats. And the entire campaign funded by voluntary contributions of local members and supporters - with no finance from the Trades Unions or public funds! Not a bad effort from a political party which the commentators claim to be "in decline"! 36,000 Photo's of Tracey Crouch is just too much ! Over the last 24 hours I have seen Tracey Crouch's smiling face 36,000 times. Lovely as she is, at times like this I wish I was in Richmond Park so I could look Zac Goldsmith - though I suspect Jon Botten disagrees. 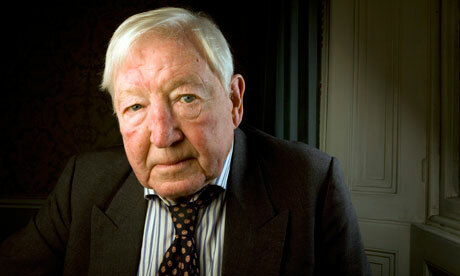 Still, must look on the bright side - it could have been 36,000 photographs of Sir John Stanley! We all make mistakes - and some of us even admit to them! For amusement, here are some of my top out-takes during my years as an Agent. Letter sent to 800 party members ahead of a general election. "...and on polling day we will need help transporting supporters to the poll. Please bring a cat if you have one." (spell check didn't pick it up, but fortunately our sensible members came in the cars and didn't bring their cats). Membership renewal letter sent to lapsing members in June 1992, following unexpectedly strong local election results and our GE victory. "1992 has been a good year for us..."
(regrettably also sent to our former MP who lost his seat at the April general election). When a YC in Wallasey, finding the first floor kitchen of our Association HQ knee-deep in soap suds after I put Fairy Liquid in the dishwasher, and using a tea tray to shovel the soap out of the window - directly on top of our MP, Lynda Chalker (Deputy Foreign Secretary), who was standing beneath the window drawing the raffle. "What the f**k is that?" It's my car Mr Thatcher. "YOUR car? What the hell is it?" It's a Citroën 2CV Mr Thatcher. "Oh! French. That explains it. How far is it to walk?" "Who's the old duffer talking to Charles Gadd." Lady sitting at my table, "That's my husband." "I am sorry, would you mind seeing my Secretary. I am stressed, irritable, physically and emotionally drained, I haven't slept or eaten for two days, I am hot, every bone in my body aches, I have run out of fags, I've got over 20 phone messages to deal with, and if that's not bad enough, in 30 minutes Angela Rumbold will be turning up and I haven't a clue who she is or what I am going to do with her." Unknown lady: Well, that's an unusual greeting for a visiting Minister. I'm Angela Rumbold. "You're standing three feet away from Andrew Neil who is doing a piece live to camera, and the world can see you behind him, scratching your backside. And why the hell are you wearing those ghastly yellow trousers?" Tonbridge & Malling are playing Tunbridge Wells in an inter-Association Golf Challenge. 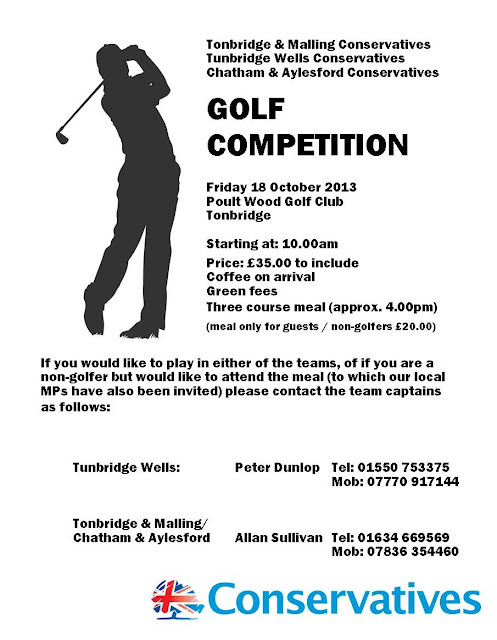 This will take place on Friday 18 October 2013 at Poult Wood Golf Course, Tonbridge, first tee: 10am. Cost: £35pp to include arrival coffee, green fees and a three course meal at the end of the competition at around 4pm. Our local MPs have been invited to the meal. T&M are short of players. If you play golf and would like to join the T&M, please contact me via this blog (use the contact me section to the right) and I will put you in touch with Allan Sullivan, the team captain. Strawberries deliver a juicy profit! Yesterday's Chatham & Aylesford Strawberry Tea was a super event by every definition. Over 70 people booked tickets - including many non-members who had seen it advertised and asked to come along. Many of those had attended their first Conservative event a few months ago, when Dan Hannan MEP spoke at a pub lunch, and were no doubt attracted to the chance of hearing Mark Reckless MP, who shares Dan's political outlook. Such a large turnout is a sign of an active and vibrant organisation. Most of those present will also be politically active come the election. Chatham & Aylesford have always been focused on winning elections; usually able to turn out canvassing teams of 20+ and get the entire constituency delivered with leaflets within 4 days. In the two years leading up to the 2010 General Election we delivered one million pieces of paper, and during the four weeks of the "short campaign" we put out on average a leaflet per week, in addition to what was distributed via the Election Freepost! It's no wonder that when deciding their target seats, the strength of our local organisation ensured Labour pushed C&A down their list of targets, so it is now below 100 in order of priority. 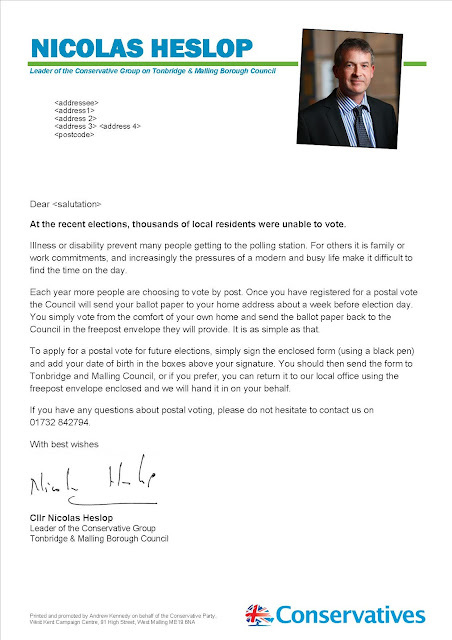 This must have come as a bitter blow to Labour's local organisers following their failure to make inroads at the 2011 and 2013 local elections. The big lesson for the Party from yesterday however is even with a difficult national political climate, with popular elected representatives and a strong and focused local team it is still possible to grow your organisation, bring new people in and make a lot of money. Despite tickets being just £5.00, with the raffle and a few donations from members who could not attend, the event raised almost £1,000 for Tracey's re-election campaign. And this is just the first of three General Election events planned for this year. And unlike Labour; every single penny of it raised from small voluntary contributions of local supporters, not a penny-piece from Unite or any other Trades Union. Flowers for the Scone Maker in Chief. 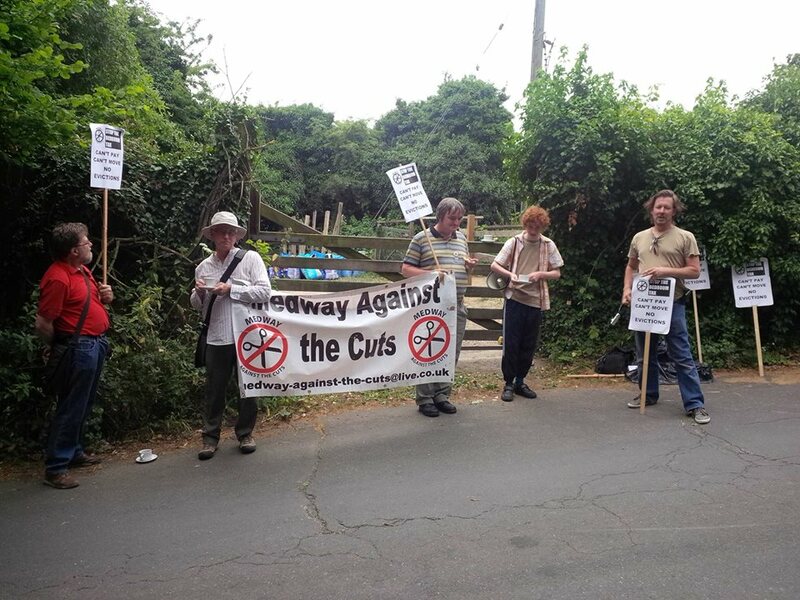 Chatham & Aylesford's annual Afternoon Tea was enlivened today when a bunch of off duty train spotters, calling themselves Medway Against the Cuts, turned-up to picket. Each time an old Volvo or Ford Fiesta stopped to drop off a load of elderly ladies wearing their best M&S cotton summer frocks they started chanting, "Here they come, the evil Tory scum." 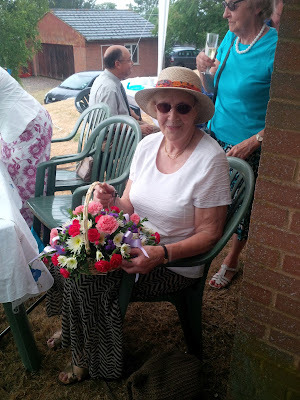 I was quite nervous when one old dear went over, I thought she was going to set about them with her handbag, but no - she apologised that she had left her hearing-aid at home and asked them to repeat what they were chanting, as she couldn't hear them very well. She then told them they needed to learn how to enunciate more clearly or no-one would understand a word they said. After an hour or so, in best Tory tradition, I decided to share the proceeds of growth, and ventured down to see them, taking with me a tray of tea and a plate of cream cakes. "It's him, it's him" said one, clearly recognising me as the Kentish Tory Typhon. "Hi chaps", I said cheerfully. 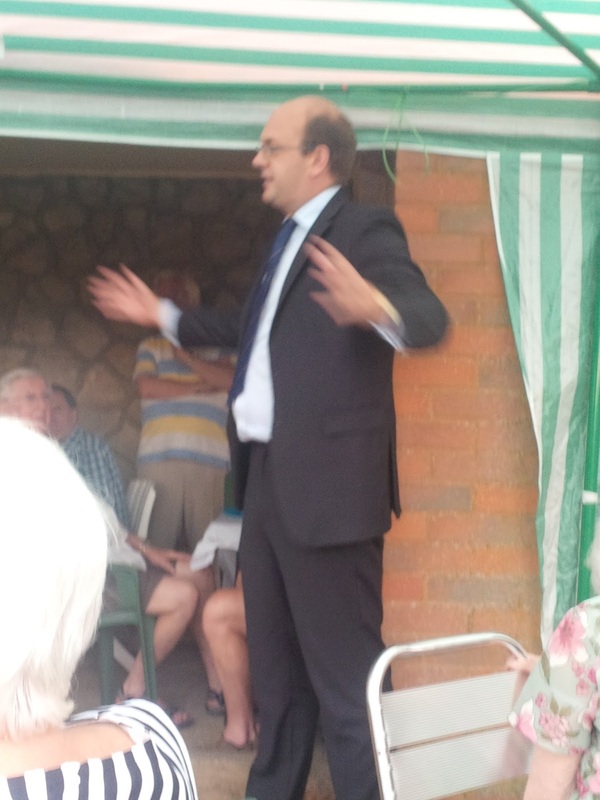 "Tories drink Champagne while the people of Medway starve" they chanted at me. Or two of them did - the other three clearly couldn't remembered the script. "You must be hot - I've brought you something to eat and drink", handing out the refreshments. "Don't take it brothers, don't let them buy you off with Tory teabags." said the chanter-in-chief. But it was too late. His Brothers had downed their placards and dived-into the plate-full of cakes faster than I could say Owen Jones. "Where's Tristan?" 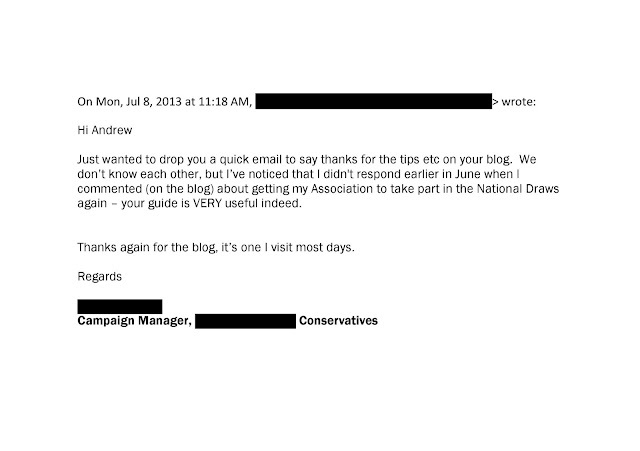 I enquired (Tristan Osborne, Labour's Parliamentary Candidate for C&A). "He's too desperate to get himself elected to be seen standing-up for the working classes", said one of the comrades, "but we've got our ways of holding him to account." "That's interesting", I said, suddenly seeing my eve of poll leaflet writing itself. "Can I take a photo for my blog". They were happy to oblige. I think I owe Jon Botten a very large drink! This is what 20,000 postal vote recruitment letters, application forms and reply paid envelopes look like! I think I owe Jon Botten a large drink - he was here alone yesterday when the printer delivered them. Yesterday was a staff outing at West Kent Towers, when Jon and I went out for lunch at The Swan in West Malling with our newest member, the world renowned magician, Jonathan Shotton. Regular readers of my blog will know that Jonathan is staging a magic show and cabaret for us next year at the Oast Theatre in Tonbridge. En route I said to Jon, "whatever you do, don't ask him to perform a trick - he's off duty, and he probably gets sick and tired of being asked wherever he goes." We were both delighted therefore when within 30 minutes of meeting, Jonathan said, "I expect you'd like to see a trick?" He then produced a pack a playing cards from his pocket, and with both of us watching him like hawks (less than 3 feet away) he first made all the spots disappear, then having done that made all the patterns on the back of the cards disappear too, leaving him with 52 plain white pieces of cardboard. His patter and skill certainly attracted attention in the busy gastro-pub garden, and we spent the rest of the lunch being watched enviously (and somewhat suspiciously) by others! Jonathan is a great guy. Despite his early success and media attention, he was down to earth, wholly unpretentious and had a genuine interest in politics and helping us build the Conservative Party. He shared our passion about involving a younger generation in politics and was willing to use his skills as a communicator and event manager to do this. Sadly he was unable to make the bill disappear - but it was worth every penny! 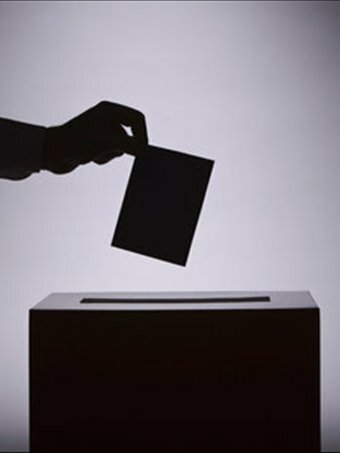 All of us involved in elections and the democratic process should encourage people to participate. 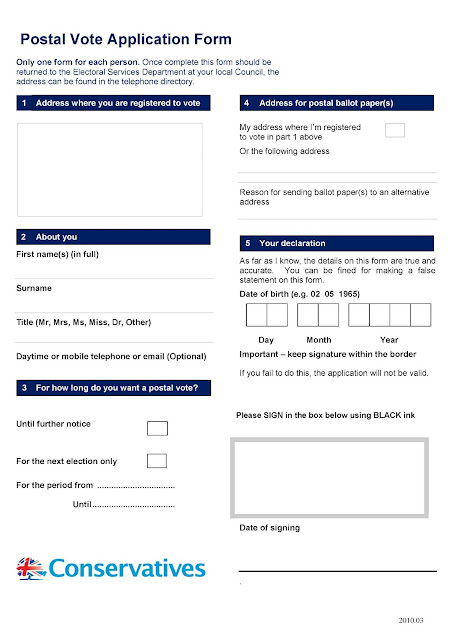 In my little corner of West Kent we are very proactive at signing-up postal voters. 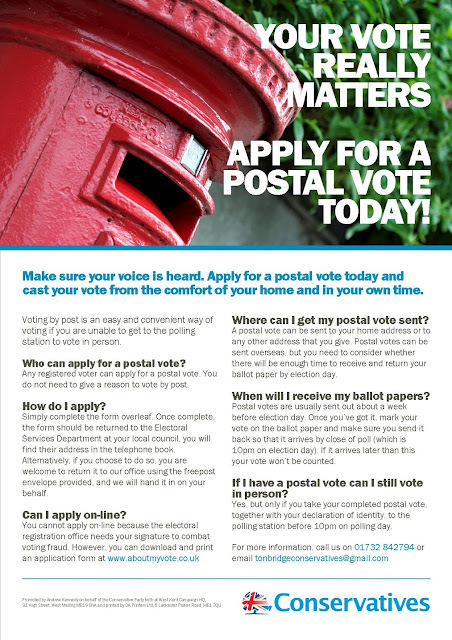 With an ageing population and ever increasing numbers of people working unsocial hours or in jobs which involve a long commute, postal voting often provides the only realistic way for them to participate. 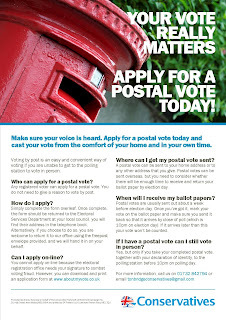 Each year we write to a selection of voters and offer them a postal vote. In doing so we adhere to the Electoral Commission's 'best practice'. 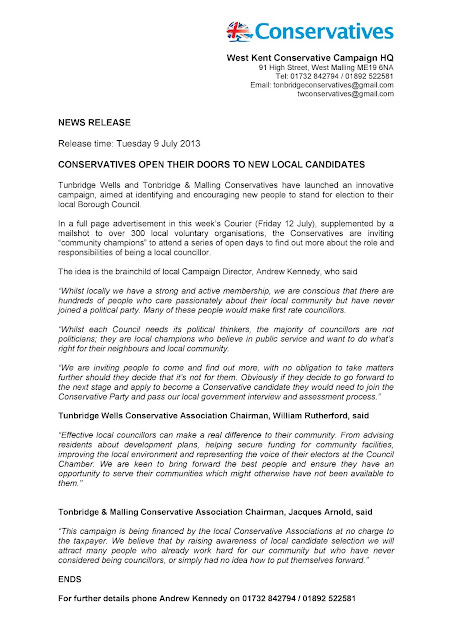 The letter goes out in the name of the leader of the Conservative Group on the Borough Council. 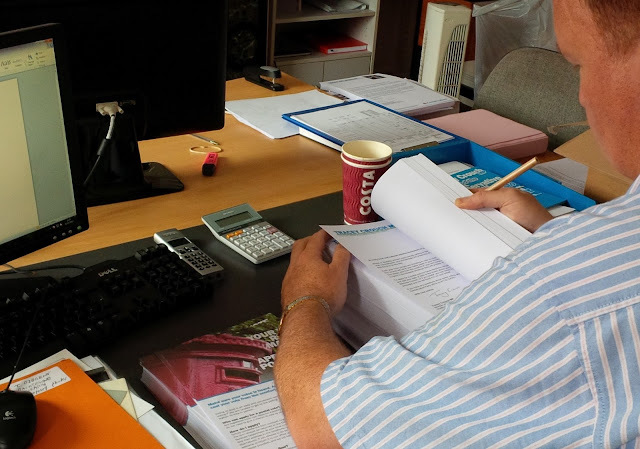 All costs (printing and distribution) are, or course, financed by the Association at no cost to public funds. Here is this years letter and enclosure. Tonbridge & Malling's Executive Council met tonight at Hadlow Manor, and we were delighted to welcome Sir John Stanley MP, who addressed the meeting at the close of formal business. Having listened to politicians address meetings like this for 30 years I am often interested, intrigued or surprised at what they say. It has been a long time since I was emotionally moved. But tonight was an exception. Even though we have two years to go, and there will probably be many more meetings of the Executive Council, this was the last one before we commence the process to select a new parliamentary candidate; and the reality is that once that person is selected, even though Sir John will remain our Member of Parliament, the spotlight will slowly fade on him as the focus turns to the new candidate. 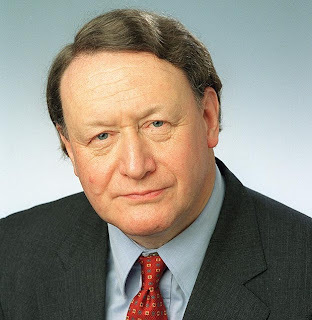 For an incumbent MP, especially one who has represented a constituency for as long as Sir John has represented Tonbridge & Malling, handling the transition must be very difficult indeed. Not many of us will ever understand how that must feel. Sir John spoke movingly about the process we are about to undertake, and I tried my best to record his words, as below. "Ladies and gentlemen, in 1938 members of a Conservative Association, just like ours, met in a room just like this. The members were people just like you. The constituency was Epping, and they met to discuss and vote on perhaps one of the most important resolutions ever debated by a Conservative Association in history, though they would not have known this at the time. The motion was one of no confidence in their Member of Parliament, Winston Churchill. Had the motion been carried it would have brought some pleasure to the then Prime Minister and his Chief Whip. As it was the motion was defeated by 100 votes to 44, defeated by people just like you, who listened to the arguments and reached their own judgement. ... we shall fight in France, we shall fight on the seas and oceans, we shall fight with growing confidence and growing strength in the air, we shall defend our island, whatever the cost may be, we shall fight on the beaches, we shall fight on the landing grounds, we shall fight in the fields and in the streets, we shall fight in the hills; we shall never surrender. Without a strong ally and a safe base, America would not have entered the war, and the future of Europe would have been very different than the one which emerged. Those 100 loyal, independent and resolute members of the Epping Conservative Executive, people just like you, not only saved Winston Churchill's career, but also saved our country. As you begin the journey to select a new candidate, I wish you every success. I hope you show the same independence of mind and determination to stand firm by what you believe in and do what is right. It has been a great honour to have represented this constituency since 1974, and I wish you success and strength and wisdom in the decisions you are about to make." 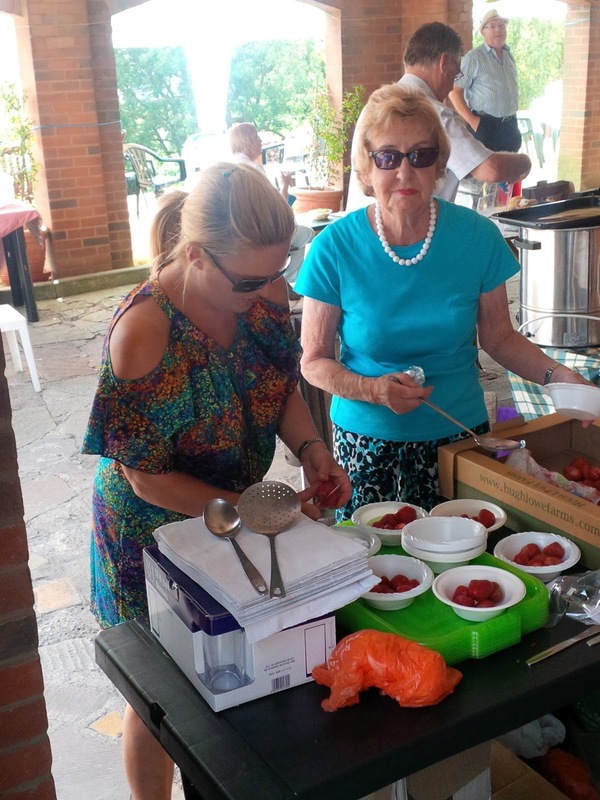 With two Executive Council meetings and a Strawberry Tea over the next three days, the opportunity to make a few additional pounds for Association funds cannot be overlooked. 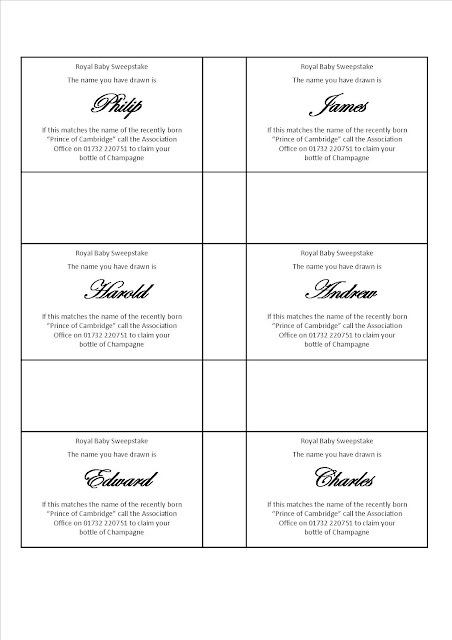 If anyone would like to participate in the West Kent Royal Baby Sweepstake, please let me know! Names £2 each (pulled randomly from a top hat). 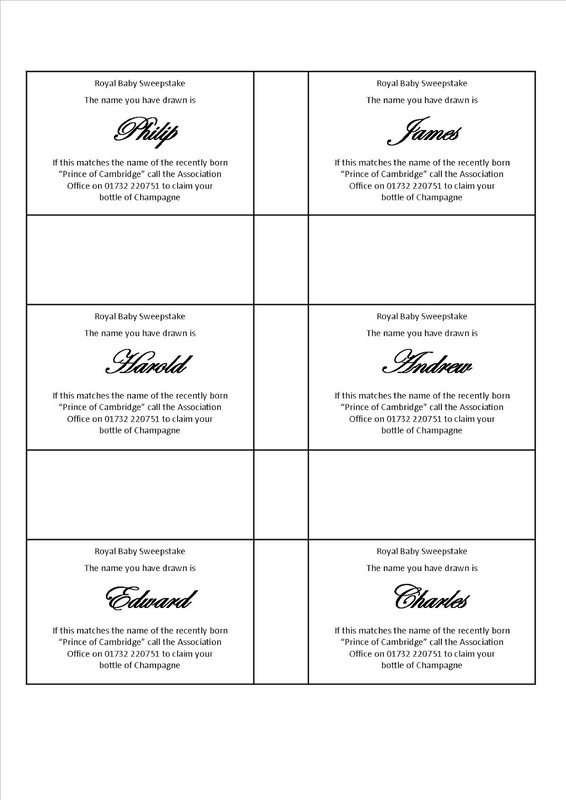 A bottle of Pol Roger to the holder of the correct name. 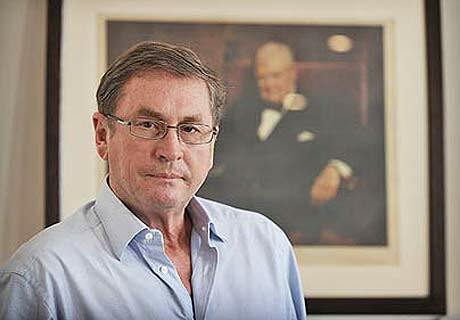 I am delighted to announce that Lord Ashcroft has accepted our invitation to speak at the Tunbridge Wells Conservative Association Annual Dinner, which will be held on 6 March 2014. Further details in due course. Faced with meeting in a small, airless and very hot committee room, the members of the Tunbridge Wells Local Government Committee (above) took the sensible decision to hold their meeting al fresco earlier this evening, commandeering the tables and chairs on the patio of the TW Constitutional Club. But meeting outside in the fresh air was not the only radical decision taken. In addition to signing-off the timetable for selections, the LGAC also agreed (unanimously) to hold a trial postal primary to select a candidate in one of our target seats. This was done with the full and enthusiastic support of the local activists. It's a delight to work with a group of progressive and open minded members who share my passion for expanding our base and finding new ways to bring people into the organisation. 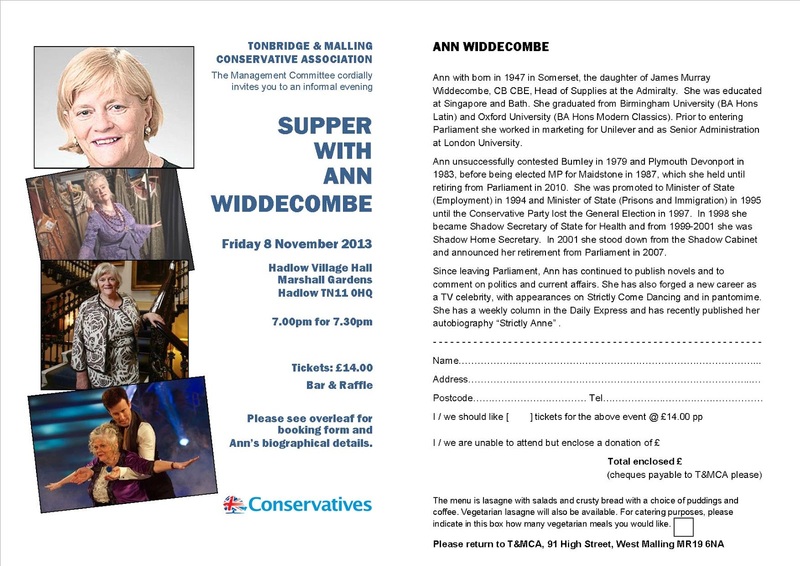 I am pleased to confirm that Ann Widdecombe and Sandy Gall CMG CBE have now confirmed their attendance at two different autumn suppers. These will both be informal events at local village halls. We do try to keep the cost of events as low as possible by holding them at local halls and self catering; cheaper tickets enables more people to come who would otherwise be unable to do so if the events were held at a local hotel with each ticket costing upwards of £30.00. Another thing we do when holding these low cost suppers with an interesting and well known speaker is we deliver a flyer to every local pledge. More often than not a handful attend for the first time. Once they have come once they are happy to come again or even join the party. I was up at 7am and on the road to Tunbridge Wells by 8am to meet-up our weekly campaign team. We had a group of fifteen out this week, including three doorstep virgins, who enjoyed it so much they are looking forward to next time! We are developing a new style of survey questionnaire; rather than simply asking people about their voting intention, we enquire about a whole range of local and national issues. Respondents have a laminated show card to guide them, and the canvasser has a personalised script for each voter. It does take longer than the old style canvassing, but the quality of the information is much better than before, and it also enables Greg to feed back into the policy discussions far more detailed analysis of voters' local and national priorities. We have also a new calling card which we leave with outs or those too busy to chat. This enables them to participate in the survey, with a handy perforated section for the resident to retain, containing Greg's contact details. Click on image below to enlarge. New Patrons have sadly missed the excellent Summer Garden Party with Michael Fallon MP as guest (hence the reduced rate), but if they sign-up now they will receive complimentary ticket(s) for the autumn dinner at the Athenaeum Club in Pall Mall with Rt Hon Michael Gove MP, Secretary of State for Education. 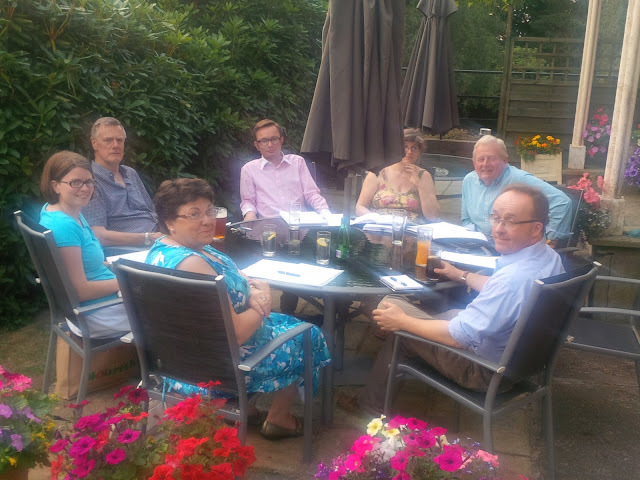 Finally, back to the Constitutional Club in TW to regroup and debrief the team; a super day with 600 points of contact. I will preface this post with an acknowledgement that there are dedicated and hard working councillors in all parties, and there are also those who don't pull their weight. The slackers are, however, the minority, and we must not allow the narrative to go unchallenged that all councillors are spongers and troughers. For the overwhelming majority this is grossly untrue. As usual, in the headlines and tweets which now shape public opinion, it is the exceptions which receive the attention and set the terms of the debate. Having said that, a recent attempt by Kent CC to increase Members' mileage allowance by 50% to 63p per mile was political folly which should never have seen the light of day. In my personal view too many councillors (again, of all parties) are unable to resist the temptation to 'go native' and to become part of the municipal establishment. Whenever I am briefing new applicants or training first time candidates I repeat my mantra that, "if elected your primary duty is to represent the interests of your electors, not to become apologists for the actions of the council." Most listen and some understand. Notwithstanding all the above, we are still fortunate to have so many good people in local government; people who have no desire to climb the greasy pole of political preferment or to exploit their office for self aggrandisement. The overwhelming majority of councillors I know (and I know many) are there out of a sense of civic duty and public service; to serve their local community and solve people's problems. And that should be celebrated. 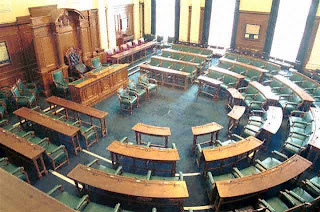 In Tonbridge & Malling a backbench councillor receives a monthly payment of just £423 to compensate them for their time. If they are of working age, tax and NI is deducted, reducing the monthly payment to £280. Or £70 per week. I have just phoned one hard working councillor I know and asked him to go through last week's diary with me. He was out four evenings (twice at the council chamber, once at a residents' association meeting and the fourth at his local parish council). As a member of the planning committee he also had three daytime site visits. He attended a school governors' meeting, a meeting at the local sheltered housing scheme to discuss concerns about crime and vandalism, meetings with the local traders' association to see how they can drive Christmas footfall and a meeting with residents to raise funds to improve the local football and cricket ground. And if these regular meetings were not enough, as a successful businessman he was asked to "sit-in" on the interviews for a new Parish Clerk which took up another 6 hours. Although last week was exceptional, this councillor believes he spends 20 - 40 hours per week on council / community business. His £70 per week allowance equates to around £2.50 per hour (and this excludes one or two hours per day dealing with phone calls and emails and reading reports). Admittedly, no-one asks them to stand for election, and given most seek re-election then they clearly enjoy doing it. But we must acknowledge that in most cases very few can be doing it for the money. So yes, we should weed out and deselect the lazy and the inept. And if a council attempts to increase allowances or expenses in the middle of a recession whilst reducing services to those in need; they should be exposed to the full and unrelenting glare of public scrutiny. But in the stampede for a sensational headline or an attention grabbing Tweet, let's not denigrate the hundreds and thousands of decent, hard-working councillors who work tirelessly for their communities and are worth their weight in gold. Many of you will know that swans are territorial, and when nesting or with their cygnets can be incredibly aggressive. A pair of swans will colonise a section of a lake or river, fighting any other local swans for control and dominance. Often they fight to the death, with the dominant bird drowning the weaker. Other water fowl can also be attacked and killed, especially if food is scarce. If they are allowed to remain they do so on the swan's terms and conditions. Up to last year there was a longstanding pair of swans on our section of the Medway. For some unknown reason only one remained this year, and seeing an opportunity a new pair moved in and built their nest. Within the last week a solitary cygnet was hatched and is now growing stronger by the day. The proud parents parade with their cygnet up and down the river, taking their pick of the bread and feed offered by boaters, with various ducks, gulls and terns picking up what the swans leave behind; a literal example of "the pecking order". The old swan, however, rather that fighting battles he must know he cannot win, has instead retired with dignity to the far end of the marina, coming out in the evenings when the triumphant pair have had their fill and left the stage. Everyone still loves him - and as a result he probably gets better and more plentiful treats than the others. 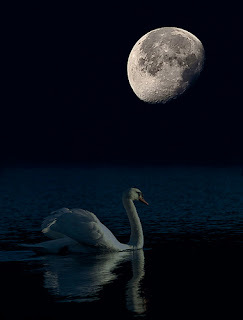 The dignity of the evening swan can teach many of us in politics a lesson. How many of us in politics (at all levels - activists, branch and association officers, councillors, agents and even MPs) fail to recognise when it's time to go with dignity? Perhaps, like the old warhorse who smells the gunpowder, we cannot resist one last fight, even when we know we no longer have the fire inside us. Perhaps it's fear, loneliness or simply arrogance. Instead we go on one election too many, and as a result are not remembered for all we have achieved, but instead are looked upon with pity and even pathos for what we have become. Although I am not yet 50, and feel I have quite a few elections still to fight, I fear this might apply one day to me. If it does, I hope my friends will tell me it's time to hang-up my rosette and exit (stage right, of course!) and I hope I have the dignity and sense to listen. For I would hate to be remembered, not as a passionate driving force seeking better ways and relishing every fight, but as a bitter and angry yesterday's man, trying to undermine my successor in a bid to prove who I used to be. BONG! Former ITN anchor man and world renowned journalist to visit Tonbridge & Malling. BONG! 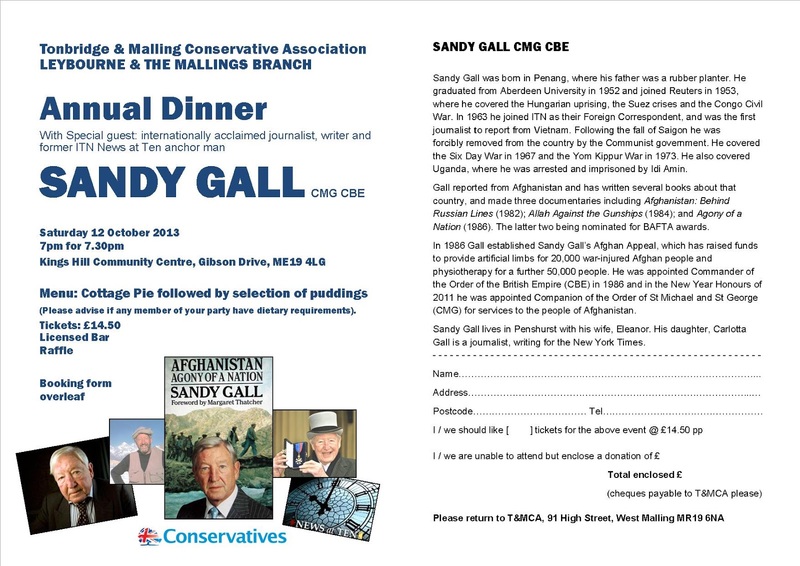 Great excitement in West Kent Towers following arrival of a lovely hand-written letter from the great Sandy Gall CMG CBE, accepting an invitation to speak at a supper later in the year. Mr Gall lives in the constituency and has agreed to attend in exchange for a donation to his charity Sandy Gall's Afghanistan Appeal. Along with Ann Widdecombe and James Wharton MP - a terrific line up of guest speakers in the autumn months! Last week there was a heated discussion at West Kent Towers. Not over equal marriage, planning, Europe or the economy - nothing so trivial. The debate was over trifle recipes. 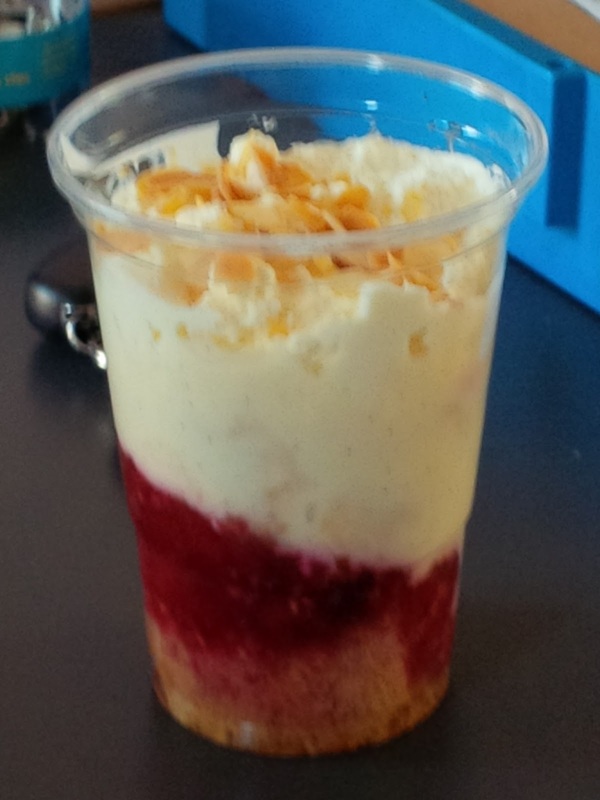 The crux of the discussion was whether a decent trifle should include jelly. I was in the 'no' camp, whilst someone else thought jelly was essential and our envelope packer was ambivalent. The debate then moved on to toppings. Toasted, flaked almonds were my choice, whilst someone else favoured "hundreds and thousands". The fact that "hundreds and thousands" man was also the jelly-lover did little to convince me of his trifle making prowess. As the debate raged, I offered to demonstrate my trifling skills by making one for the team to sample. Predictably, I forgot - until 11pm last night whilst driving home from the cinema, having seen Behind The Candelabra. "Sorry love, we need a detour to the all night supermarket", I said, to a bemused and not too happy partner, who clearly thought I was barking mad to be shopping then making trifle at 11pm. However, I had promised, and I knew my colleagues would remember! Honour was at stake! By midnight my trifle was made, refrigerated then, this morning, carefully transported to West Kent Towers in a cooler box, whereupon my office colleagues looked at my with bemusement, as they had all completely forgotten about the promise! Tomorrow I take the first steps into show business, with a trip to Hildenborough's Oast Theatre, which I am hoping to hire to put on a New Year production. This has all come about quite suddenly and unexpectedly. Our Office Administrator / Campaign Assistant, Jon, handles membership renewals and data management, drawing my attention to anything in need of a personal response. One day last week he informed me that the morning's post included three new membership applications in response to our latest mailing. As there was nothing out of the ordinary, having told me the figures he processed the membership and put the cheques in the drawer for banking. Fortunately, our book-keeper, Edward, was on holiday last week and as a result I was doing the banking. As I entered the cheques I noticed one where the name printed below the signature appeared to be a company or trading name "Enchanted Magic". 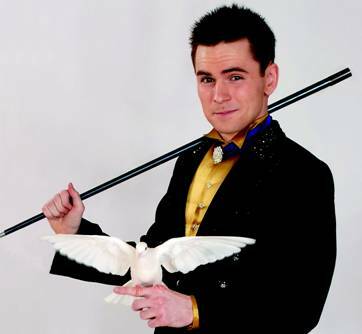 A quick search on Google led me to the website of a magician and recent winner of the Magic Circle's "British Champion of Magic" award, who not only lived in the constituency, but was one of the three new members mentioned above! Had Edward not been on holiday, the cheque would have been banked by him and I wouldn't have been any wiser. As it was, my Agent's nose for an opportunity started twitching. A quick letter to our new recruit resulted in him agreeing to put on a full stage show for us. 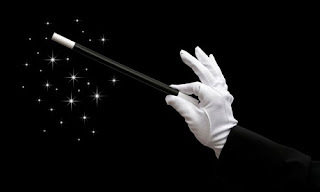 We will be getting a full stage show followed by an hour of close-up table magic whilst guests eat their meal, which will be served in the private dining room in the Oast Theatre complex. It will make a change from the usual round of quiz nights, wine tastings and hot pot suppers! Watch this space for more information. His name is Jonathan Shotten, and here is his promotional video. Late last evening I received a message on Facebook from a distant friend. It was asking me to 'like' a Facebook page entitled "Boycott the (name of hotel) in (town)". I have deleted any references to the hotel or the people concerned as I have no wish to fuel the story. I clicked on the link out of curiosity; why would an old friend from 15 years back, who I doubt has ever travelled to Scotland, feel so angry about an hotel as to encourage his friends to dislike it by proxy? In a nutshell, a lady was holidaying with her family and they visited the this hotel for lunch. Included in the party was her uncle who has Down Syndrome. Allegedly they were left waiting for twenty minutes, given 'dirty looks; by staff, and when someone finally came to take their order they would not allow her uncle to order fish fingers from the child's menu as he was an adult. When the complained, a supervisor came over and said, "we cannot serve you today" and asked them to leave. The aggrieved lady quickly set-up a Facebook page telling her story, accompanied by several pictures of her uncle, and circulated the page to her friends asking them, in turn, to spread the message. At the time of writing, the page has been shared 21,313 times, and the number is growing by around 2,000 per hour. Thousands have posted messages of support. The hotel's phone number, website, fax number and email address have been published along with messages encouraging people to bombard the hotel with angry complaints. The managers name has been published (but thankfully not yet his home address, but will it be long before someone traces him and does so). Visit Scotland's website is under siege, complaints made to MPs, the Disability Scotland Campaign Group, similar posts of the hotel "discriminating against disabled people" have been posted on other travel and hotel review sites. What is also noticeable is that the few people who dared to post messages saying that the hotel should be allowed to investigate and respond have also been attacked by the baying mob and accused of hating disabled people or likened to Hitler. What we do know, however, is apart from the family concerned, 23,000 people have expressed a view based on no more detail that one persons interpretation of events. I have no reason to believe the complainant is not genuine, and if her complaints are proven then clearly the hotel needs to make redress and seriously review it's training and development policy. Other than that I am not going to comment as I was not there. What we do know is the hotel might have found their reputation destroyed by what might be an unhappy or poorly trained member of staff, or one who did not feel sufficiently empowered to change the rules over serving a child's meal to an adult. This does, however, show how vulnerable any organisation or individual is to trial by implication in the court of public opinion and the very real and instant risk to reputation from social media, with very little redress should the accusations be false or malicious. 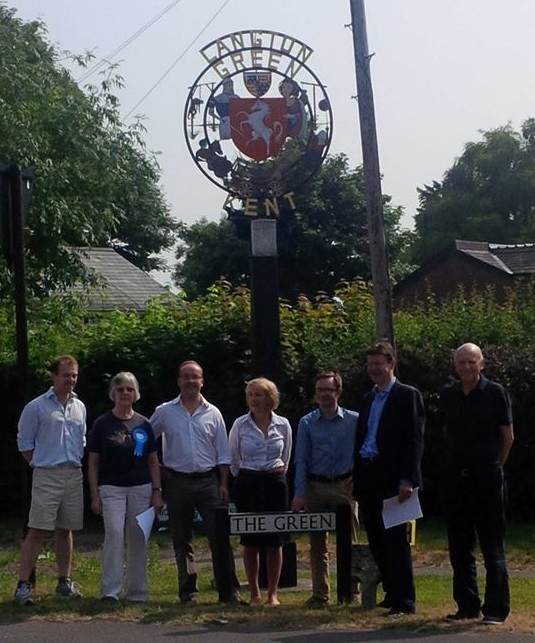 Campaigning in Langton Green and sartorial advice to Croydon Tories. All in a day's work. I left home at 8am today to join ten (Mad Dogs and Englishmen - and women) who were out in the blistering heat campaigning in the lovely Langton Green area of Tunbridge Wells, along with the local ward councillors Julian Stanyer and Julia Soyke and MP, Greg Clark. Greg had to pop off during the session as he was "official invigilator" at the Rusthall (neighbouring village's) attempt to break the World Record for the number of people simultaneously making sandwiches. Sadly, the record was not broken, but a lot of money was raised for the local Hospice in the Weald. We were trialling our new local issues survey, with laminated show cards and our new swish "reply card" with perforated reply paid questionnaire with self gummed edges! Very radical for TWCA. The new-style survey, whilst taking longer on each doorstep, proved popular with residents and campaigners alike - even the less enthusiastic members of the team were won-over quite quickly. Today provided two examples of how difficult it is now to deliver any form of service or improvement which is universally popular. I was canvassing along one semi-rural road which had no streetlights. One resident said she would feel safer if there were lights, whilst another said how awful it would be if lights were installed as it would encourage drivers taking a shortcut and ruin the semi rural ambiance. At another door a lady was complaining about the proposed expansion of the primary school as there was already too much traffic and congestion whilst three doors away a young mum hoped the school would expand soon as she was concerned her own 3 yo child might not get a place. Well, our campaign to find new local government candidates is off to a great start. Fifteen potential applicants have already been in touch and booked a space on one of our Open Days - all but two of which were unknown to us. Clicking on the link will take them to our website with details about how to apply to attend one of our open days. 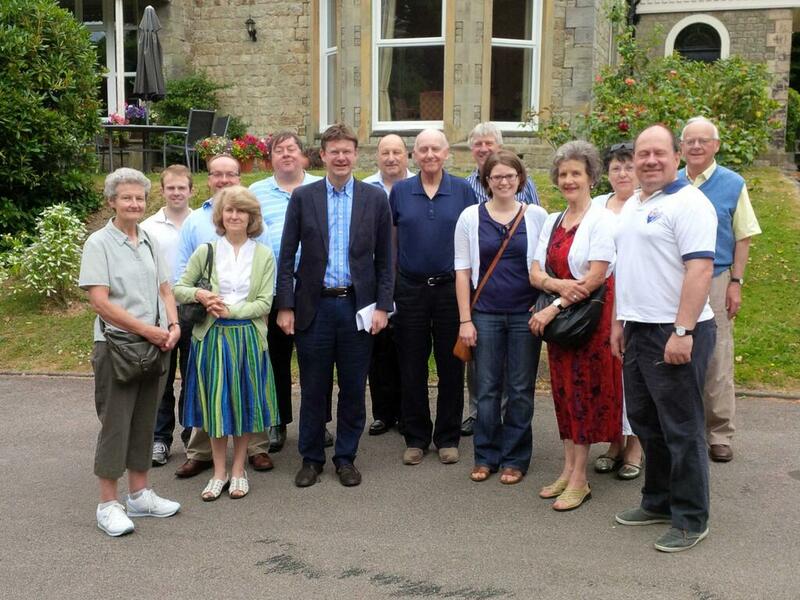 Now off to bed as up at 7am tomorrow as I have a team of 15 canvassing in Tunbridge Wells! 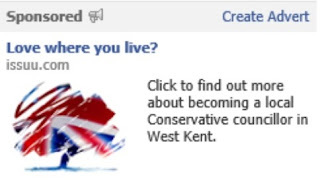 A few weeks ago I hinted at a new and innovative campaign that we would be launching in West Kent; another example of our determination to reach out beyond our core membership, to encourage participatory democracy and welcome new people into the heart of the Conservative Party. Tomorrow (Friday 12 July 2013) the following full page advertisement will be appearing in the Kent & Sussex Courier newspaper. 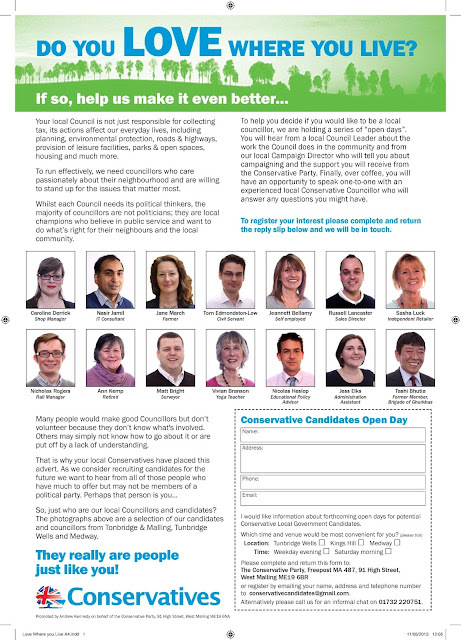 It is an invitation to residents to attend a Open Day to find out more about the work of a local councillor and to consider if they would like to become a Conservative Local Government Candidate. If we receive a good response we will run the same advertisement in the Kent & Medway Messenger Group, which covers the Malling part of Tonbridge & Malling plus the Chatham & Aylesford Constituency. 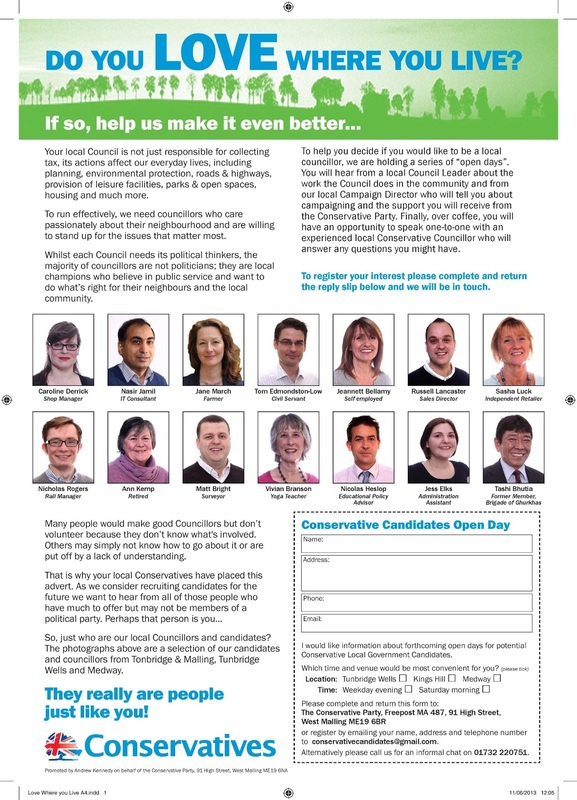 In addition to the full page ad in the Courier, copies of the leaflet have been sent to over 300 community groups (such as Rotarians, WIs, Neighbourhood Watch Groups, Round Tables etc) as well as to 1,000 Conservative Party members. We will also be handing the leaflets out at railway stations and delivering them door-to-door in some our target wards. The press release (printed below) explains why we are doing this, and what we hope to achieve. Not only is it another example of how we are trying to reach out to the wider community and involve them in our work, but to send a message that the Conservatives are open to all, inclusive on pour approach and unafraid of innovation. I am also keen that we widen and deepen the pool in which we fish for our candidates and councillors. 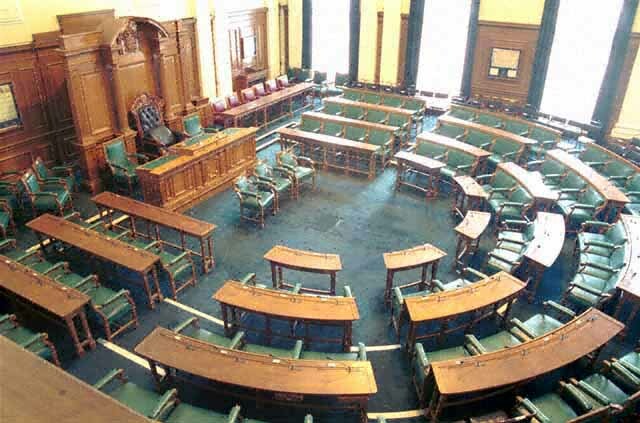 Some of our most outstanding councillors were not party members and had never before considered standing for election until a chance meeting planted the seed. I want to bring in new people, with new ideas and enthusiasm; both to renew our organisation and bring fresh thinking into local government. 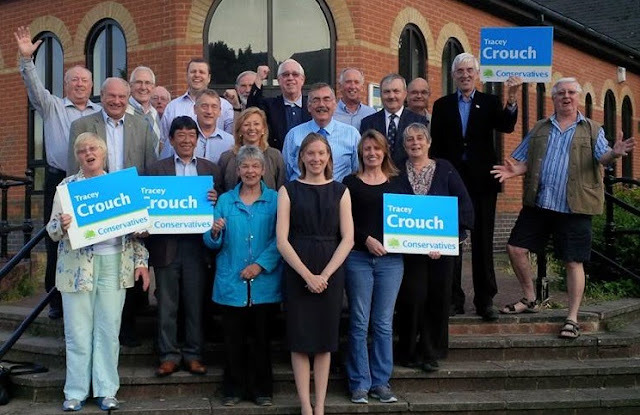 Chatham and Aylesford's outstanding Member of Parliament, Tracey Crouch, was unanimously re-selected as Conservative candidate for the next General Election at a meeting in Princes Park a few hours ago. I am honoured that she immediately appointed me as her Campaign Director. Tracey now has the advantage of incumbency, a still strong, determined and battle-hardened campaign team plus the confidence from a poll which demonstrates that despite mid-term difficulties for the Coalition, Tracey's personal approval ratings in C&A are +63% and she outpolls the opposition by 26 percentage points amongst those most likely to vote. With Labour failing to make any inroads in the constituency during the recent Kent CC elections* I am predicting a tough campaign resulting in an increased majority. *During the recent Kent County Council elections, Labour finished third in Malling Rural North East on just 16%, FOURTH in Larkfield on just 7% and even contrived to lost their former stronghold of Snodland for the 8th consecutive election. "I was particularly interested in your commitment to improving resources for elderly person's podiatry services in the Medway Towns following your chance encounter with an elderly fan of Bruce Forsyth's Strictly Come Dancing." The letter was sent in response to a meeting I had yesterday with a local supporter and GP, who is also Chairman of the Medway Clinical Commissioning Group. He had called in for a general chat and to keep me up to date with his new role, part of the health reforms which bring together health providers, local authorities, patients and the wider community, to deliver a better, more cost effective and efficient health service. I asked if there was yet any concrete evidence of the reforms working, or bringing about positive change for those who use and need services most, ie, the patients. Too often, reforms are hailed as a success as they streamline internal structures or create new bureaucracies, whilst not doing anything for the end users. The story he told was of an elderly lady who lived in a residential care home. She appeared at one of the public meetings he now regularly holds and raised the issue of waiting lists for podiatry services. Apparently the wait was up to 9 months (and was likewise under the last government, too). In an environment which understandably focuses on acute care, podiatry might not seem a priority, but if you are elderly and in agony with ingrowing toenails or bunions, and cannot put on your shoes or walk due to the pain, the consequences are very severe. People walking in pain are more likely to fall, or become inactive and immobile leading to increased threat of strokes or thrombosis. Therefore improvements in provision of a reasonably low cost service can actually save the Health Service considerable sums of money dealing with falls, broken hips and more serious conditions, whilst also significantly improving the quality of life. The central point of this tale, however, was the lady's insistence that any improvements were in place "by September at the latest". She made the point audibly and kept returning to it. My GP friend asked why September was so important, he could see no significance of the month "Is your concern based on the onset of autumn and the increased fear of slipping on fallen leaves", he enquired. "you might be a doctor, but you're not very bright, are you?" said the lady. 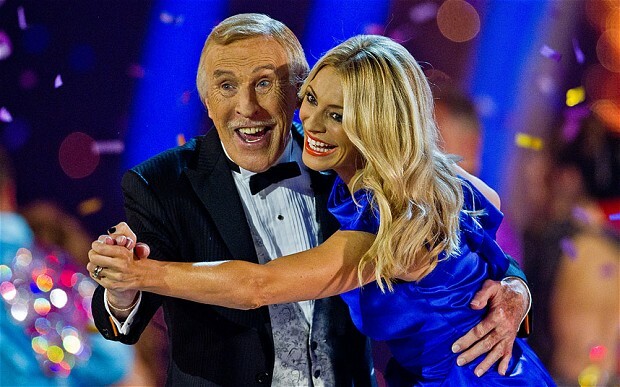 "The new series of Brucie's Strictly Come Dancing starts in October and we all like to dance around with the celebrities. How do you expect us to do that if we've all got painful bunions and corns?" Following the exchange he visited several care homes and found out just how extensive the problem was. As a result, he arranged for increased resources into podiatry and our ladies have now been promised treatment before the return of Bruce and his dancing celebrities. An amusing, but no less important example of how when service providers actually come face to face with their customers, it can bring about change. Let's hope this is just the tip of the iceberg and our health providers really do start to remember that patients are the customers, whose taxes have paid for the services they receive, and are entitled to be treated with dignity and respect. Six years ago I was involved in the selection of Tracey Crouch as candidate for Chatham & Aylesford. 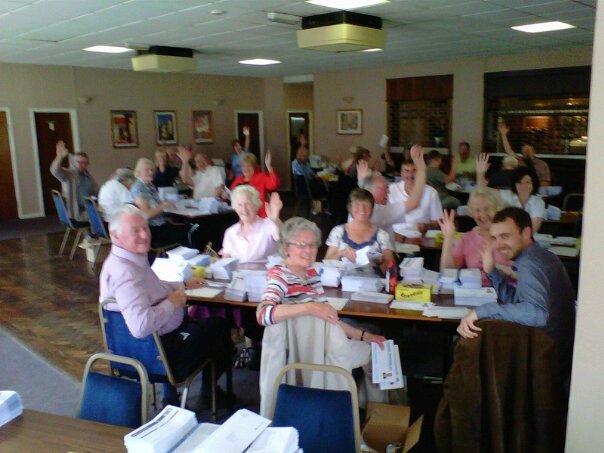 We were one of the first constituencies to use an Open Primary, where residents are invited to the final meeting, to hear and question the applicants, and to cast their votes alongside those of party members. I was attending that meeting as an activist, not an employee. And like many activists at that time I was suspicious, a knee-jerk reaction against those who have never paid a penny nor delivered a leaflet having an equal say in who should be the Conservative candidate. Unlike many, however, I kept my doubts to myself. My opposition was tempered with a realisation that even in 2007 (when party membership was stronger than it is now) the people around me (despite being friends and colleagues of many years standing) were far from representative of the average Conservative voter, and even less representative of the average constituent. Unfortunately, lack of enthusiasm from the wider membership coupled with a shortage of funds to promote the Open Primary, resulted in a small lineage ad on page 64 of the local newspaper. As a result, only two people attended who were not already members. The poor response empowered those who were opposed to the idea, "all that effort and just two people came." 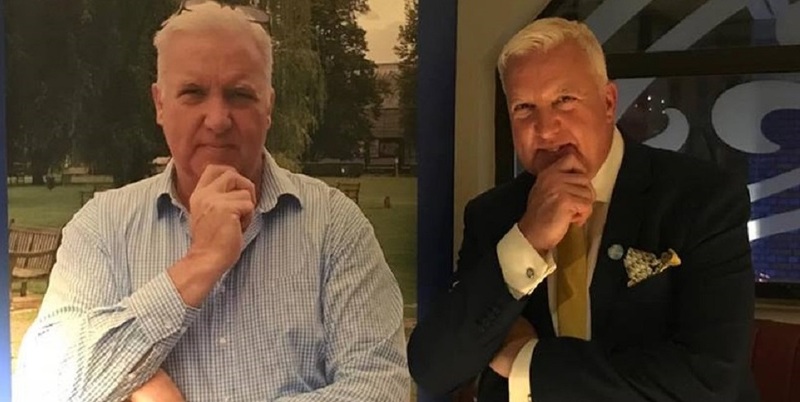 The "effort" was expenditure of £23.50 on a well-hidden advert, and the fact that both of those who came subsequently joined the Party and became active members, has been airbrushed from collective memories. 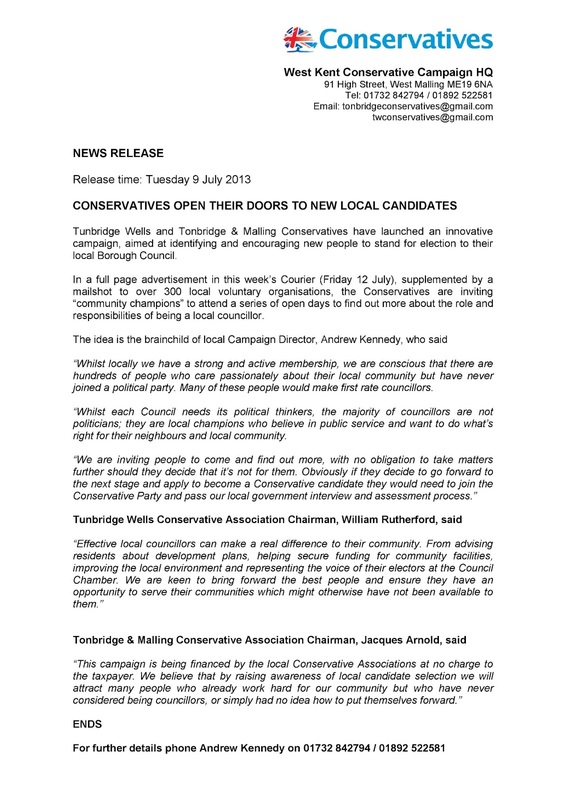 So here we are in 2013, and many Associations are selecting candidates, including Tonbridge & Malling. It is no secret that political membership is in decline. Apart from a few constituencies in London, the average age of activists is older than ever before. The scale of the problem hit me hard last week whilst I was data-mining to see if we could launch a "commuters group". I started by extracting from Merlin all members, donors and activists - and I had a list of nearly 2,000 names. I then excluded those aged 65 and over and the list reduced to 120 names. The brutal realisation of this cannot be ignored; 94% of our members and activists are retired. And I suspect no other Association in the Home Counties would produce wildly different results. As Lord Ashcroft wrote following our last defeat; we must wake up and smell the coffee. Can any organisation whose membership is 94% retired, almost exclusively white and predominantly male, really understand the hopes and aspirations of an increasingly young, multi-cultural and socially liberal society? When the successful candidate is chosen, and the TV cameras pan across the clapping audience, do you really think the image we will send to the electorate will be, "look - we really are just like you?" But my support for Open Primaries is not wholly altruistic. 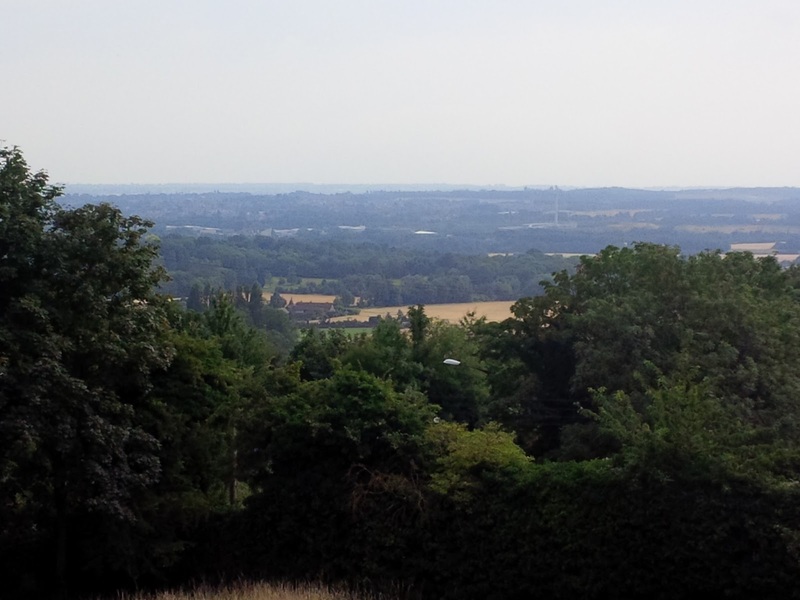 Time and again I have blogged about my ambition for the Party to reach out beyond its ever-narrowing base and find a way to include the 29,000 Conservatives who live in this constituency, of which only 2% are members. What better way is there to send a message that we are serious about listening to their views and including them in the political process than to invite them to help us select the next Conservative candidate? And once they have responded and participated in that process, and felt wanted and respected, how much easier will it be for them to make that further step by joining the Party or responding to our request for help? Surely, if you have been involved with the selection of the candidate, you feel a sense of ownership and responsibility. There are concerns - the 'what ifs'. "What if they turn up and select the wrong candidate?" Well, the shortlisting and interviewing will still be done by members - so the candidates who are presented to the Open Primary will have been selected by the members. "What if the opposition send people along who hijack the meeting and vote for the weakest candidate?" As above, the paid-up membership will be responsible for the shortlist; provided they only put through outstanding candidates, we cannot go wrong. "What's the point of being a member if we cannot choose our candidate?" Well, you are choosing your candidate. The candidate will be one of the three or four you put forward. Even if it was a members' only meeting, there is still a strong chance that the candidate you wanted would not be selected. "Is the situation so bad that it really warrants such a fundamental change?" If we always do what we always did, we will always get what we always got. And the truth is, despite leaders from the left, right and centre - we have not won an election for 22 years. If someone was 17 in 1992 they would now be 40 and would not have voted for a majority Conservative government. We must find a way to reach out beyond our base. Thank goodness the Conservative Party has stopped allowing itself to be defined by who we are against ,and have started being judged on what we believe in. For someone like me, from a single parent family, brought up on a sink estate in Merseyside, who was not born into the Conservative Party but choose it because I believed it offered the best opportunity to fulfil my hopes, it is a joy to read that we are attracting more young and first time voters than ever before. The greatest service our older members can now perform is to nurture that support by sending the following message; "we trust you, we value your judgement and welcome your views. This is your Party, too." Obviously any selection process is for the members to decide, and as a servant of the Association I will respect the decision they reach. Whatever the outcome, we are in for exciting times and it is a great privilege to have a ringside seat. I received two lovely emails in the last few days from Conservative activists, each thanking me for maintaining this blog, and commenting how, in some small way, I make a difference. 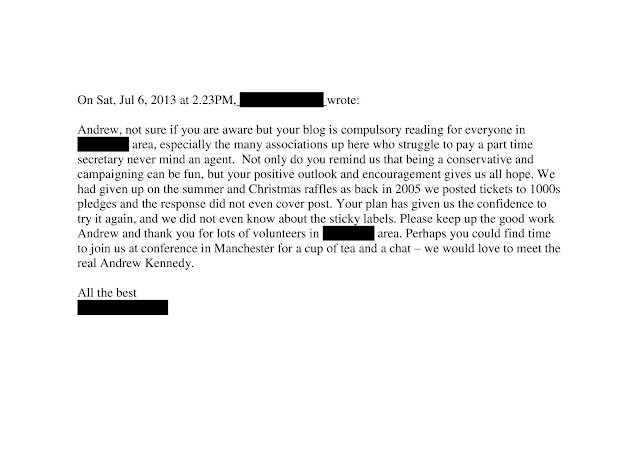 As always, to preserve anonymity I have removed any identifying references, but they make nice reading nonetheless. I have now received over 50 emails or messages of thanks from Associations or individual activists who have downloaded our Tonbridge & Malling Guide to Running a Successful Summer and Christmas Draw. (i) Rochester and Strood are not part of the West Kent Group, but their Chairman asked if T&MCA would administer their 2013 Summer Draw to see if we could make a difference. Across the four constituencies, three increased their income and one had a small reduction. Overall we increased summer draw income by 14%. Not a bad result given the political and economic climate and the general negativity in the media about our political fortunes. Send three and fourpence. We are going to a dance. Several of our local members have been invited to a reception. The invitation said, "at a location near Orpington - venue will be confirmed later." I immediately started receiving calls and emails asking if the Prime Minister was attending, as the invitees correctly recognised the form of words used on invitations where he is coming, but it cannot be confirmed for security reasons. Obviously at my pay grade I am not privy to the PMs diary, but I did my best to dampen expectations. I did, however, mention this to the organisation's Regional Chair, just in case the rumours got out of hand and hundreds turned up and were disappointed. She confirmed that the PM wasn't coming (though she would have been delighted if he was). Matter closed. 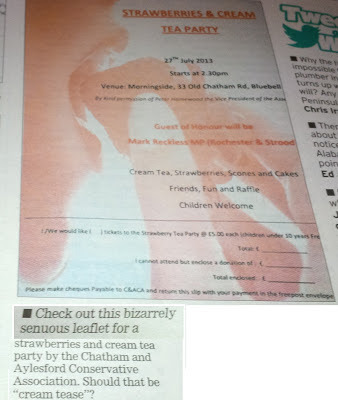 The Regional Chair obviously phoned the host of the event to mention that rumour and dampen expectations. The host (who had no knowledge of my conversation the previous day with the Regional Chair) then phoned me to say, "I don't know if you have heard, but lots of people think the Prime Minister is coming...." "Really?" I said, sounding surprised whilst trying to dampen expectations. "Who told you that...?" "I cannot say - but it was someone senior..."
So the rumour gets new legs! Now either this is a triple bluff and he is coming - or I fear (more likely) there are going to be a lot of disappointed people. Including the host who has probably spent the last week scrubbing her house from top to bottom in expectation of a visit from the First Lord of the Treasury! A few weeks after my canary yellow trousers featured in the Kent Messenger's "Mouth of the Medway" gossip column, we're in the news again. 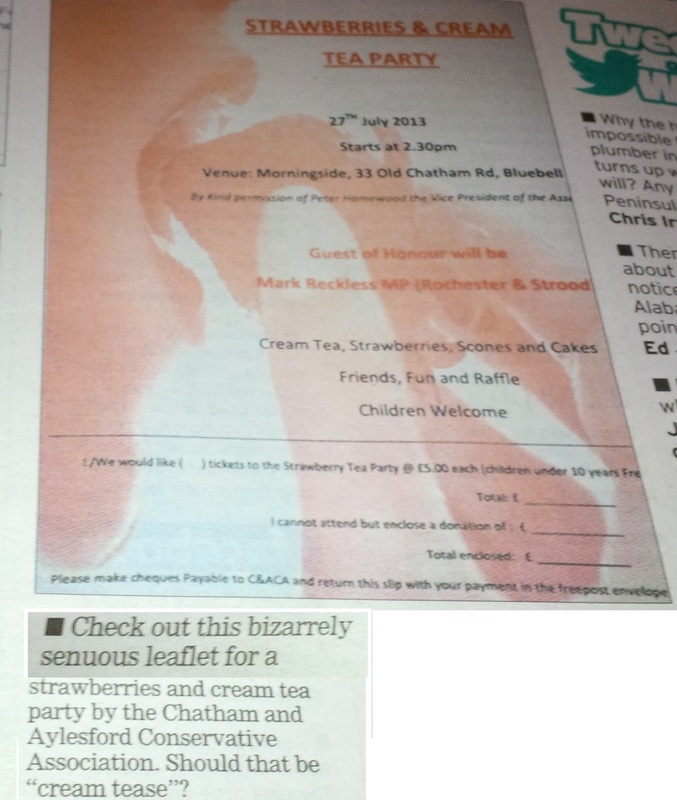 This time it's the poster advertising our forthcoming Strawberry Cream Tea which seems to have caught their attention. I must say when the branch organiser brought them into the office, I did think "that's a bit risqué". I was just grateful that it hadn't been dipped in cream. And just think - a few years ago the only exciting thing that happened in Chatham & Aylesford Association was the Snodland Branch Jumble Sale. Where do you store ten dead barons ? JULY - Off to a flying start ! Around the world on a grand! Something to excite the old boys!